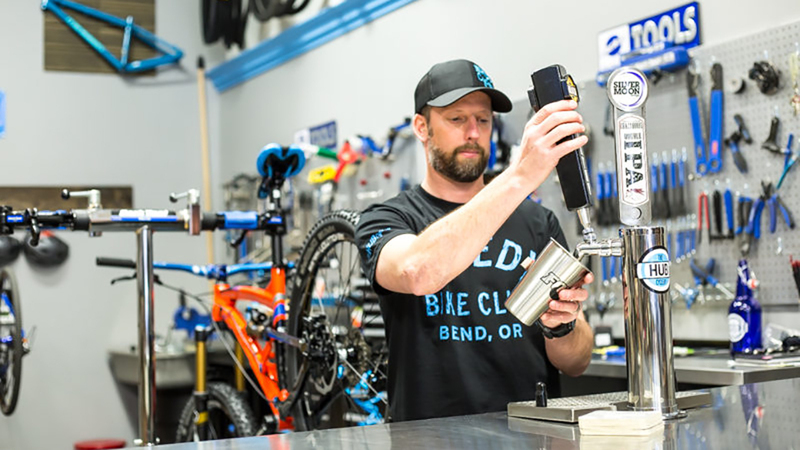 The Hub Cyclery calls itself “Bend Oregon’s Hub for Bikes, Craft Brew and Community.” Located in the heart of downtown, they sell some of the top brands in the industry, hand selecting each vendor to give customers the best in quality and affordability. Central Oregon’s Felt Cycles dealer, they also carry great brands such as All-City Cycles and Foundry. Their service department provides a professional, friendly environment that caters both to experienced and recreational riders alike, taking great pride in their work to build a lasting relationship with customers. Offering basic and complete tune-ups, as well as completed overhauls, they also specialize in custom bike and wheel builds as well as suspension service. Offering daily and weekly mountain bike, town cruisers, and fat bike rentals check online for what they have in stock and call or email for availability and reservations. Open 10:00 a.m. – 6:00 p.m. Monday – Saturday.